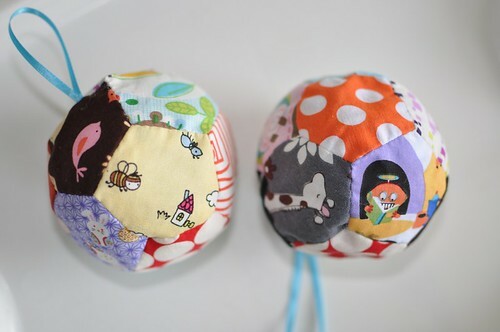 I recently saw a super cute baby ball at Patchwork Delights, so wanted to make some for Sunshine and my niece. I used Lori Hanson’s tutorial and freezer paper, which meant I only needed to use one of the templates. Yay for skipping a step! 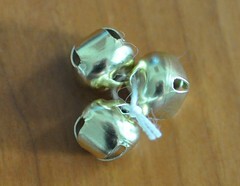 I sewed a ribbon loop into the balls so they can be hung from play gyms and things, and I also put three jingly bells inside. I left them pretty squishy since Sunshine and Dawnybear aren’t very old yet and are still working on their gripping power. Next, I have to try washing them… hopefully the stuffing won’t get all weird!